The amazing canine advocate Deirdre Franklin (“Pinups for Pitbulls”) recently released Little Darling’s Pinups for Pitbulls. The book is available in stores now and available online at her official website and of course at Amazon and Barnes and Noble! Almost ten years ago, Deirdre Franklin founded Pinups for Pitbulls in 2005 with a mission to help pit bull type dogs. It began with an annual calendar – the first Pinups for Pitbulls calendar was released in 2007 — featuring advocates as pinup models alongside adorable mixed breed canines. The calendar became a huge success, and now Pinups for Pitbulls is one of the most unique and effective canine advocacy nonprofits out there. 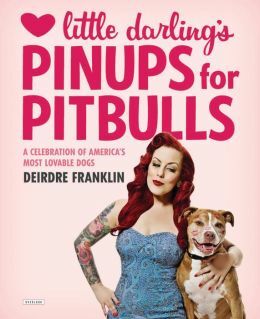 Little Darling’s Pinups for Pitbulls describes Franklin’s background and inspiration, the organization’s history, and her efforts to educate the public. This book is a great read for anyone passionate about animal advocacy, not just for fans of Pinups for Pitbulls. Little Darling’s Pinups for Pitbulls is a memorable read, not only because of the eye catching, bright photography, but also for its accompanying text. It successfully weaves together informative topics such as the history of the breed, breed discrimination, and dog training with personal stories detailing the impact dogs have on our lives. For example, not only will you read about Carla Lou, the dog who inspired Franklin, but you’ll also learn about breed specific legislation and the harm it can cause. Connecting bigger issues such as breed discrimination to the stories of individual dogs is an achievement in advocacy. And the connections are artfully made; the featured photographs are some of the best images from past calendars, which readers may be familiar with, but there’s also plenty of behind-the-scenes images that will be new even to the fans. For fans of Pinups for Pitbulls, this book provides insight into the organization’s beginnings, where you’ll learn how Hurricane Katrina and the dogs Franklin met in Louisiana changed her life. While assisting with search and rescue for the animals reported missing, Franklin became acutely aware of the disproportionate amount of pit bull type dogs who were in need of rescue, which became a defining moment for the organization. To help shelter dogs, the public must be educated. The book makes education fun with a short but descriptive history of pit bulls and powerful quotes from proud pit bull owners. Those who enjoy reading rescue stories will love the section featuring the many pit bulls who have touched the lives of Franklin and other members of the organization. Franklin also achieves in her mission to dispel the negative myths and stereotypes of pit bull dogs: especially with the stories of dogs like Bodacious, who was an American Humane Association Hero Dog nominee, or Hector, who was one of Michael Vick’s fighting dogs and is now a therapy dog. You’ll probably need to have some Kleenex handy as you read these stories, but the book is never sad – instead, it’s a heart-warming success story. Little Darling’s Pinups for Pitbulls is the perfect coffee table book – blending education with entertainment, it will catch the eye of whoever flips through the pages, but more importantly, its pages will inspire and motivate you to advocate for America’s Most Loveable Dogs. Get yourself – and all the dog lovers in your life – a copy, and you’ll enjoy flipping through the colorful pages time after time. To read my interview with Franklin about the book, the organization, and more, please click here. BREAKING NEWS: Horse Carriage Ban Introduced in NYC!